There are many components made for Adventure Motorcycles that should be considered before taking to the dirt. Protection, Ergonomics, Luggage, Lighting, and Performance equipment are just a few of the core elements to be contemplated when traveling beyond familiar territory. Nothing can offer 100% preparation for any unforeseen circumstance; But with the right selection of equipment, you can handle just about anything the adventure throws at you. Adventure motorcycles are known as the HMMWVs (Humvee) of the motorcycle word; why not armor it like a tank? You can, and should do so. When riding off-road for any length of time it becomes a certainty that you will encounter a meeting with gravity, a large stone and/or piece of debris smacking the bottom of your bike, an extended tree branch slapping your hand, a hypersonic rock kicked up from the bike in front of you with a bead on your headlight or radiator, and all those other instances and obsticals that lay in wait just around that blind corner. Your bike got you there and you need to ensure your bike can handle it and get you home relatively unscathed. Skid Plate - There is not much distance between your bike’s engine and the ground. 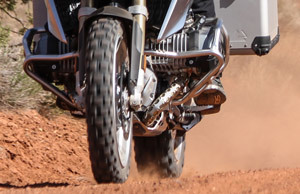 When the road gets rugged enough for your bike to make downward contact with the rocky earth; it is wise to have a hefty skid plate that can absorb and disperse the energy of the impact. As an example, take a look at the video to the right from Black Dog Cycle Works on the advantages of an aftermarket skid plate over what comes stock. Engine Guards - When the bike goes down on it’s side, and it will, a good set of engine guards can take the hit and protect not just your engine but most of the body panels and other components that could easily break. A good set of Hard Luggage in combination with engine bars can further protect your bike’s engine, body, and possibly your leg that could otherwise get pinned in certain situations. Touratech, Black Dog Cycle Works, Happy-Trails, and AltRider all offer solid engine guard solutions. Brush Guards - At a good clip, those stray, overhanging tree branches can sting something fierce, like a slap from teacher’s ruler across the knuckles. And if your hands are already whitened and cold from the dropping temperature, you have to ask yourself if your are simply a glutton for punishment. 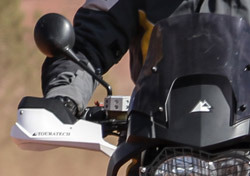 A good set of brush guards (hand guards) like those sold by Touratech USA can not only protect your hands and levers from stray earth and flora, but also help deflect wind chill in cold weather. Headlight Screen - If you ride off-road with friends at some point a pesky pebble will get launched from the back tire of your buddy’s bike and deliver itself to your headlight. Add a layer of protection between that headlight-seeking rock and your bike with a metal mesh or plexiglass/clear resin headlight guard. These 4 items are just the tip of the protection iceberg. Check out the many other bike-specific protection options made by the companies mentioned above and featured below. Many of the items mentioned above are several steps above the level of protection offered by stock items equipped on your bike. Therefore, they all qualify as upgrades in terms of protection. There are, however, many other upgrades that greatly improve the performance, ergonomics, and comfort. 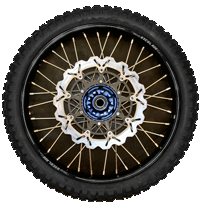 Other than the tires mounted on the wheels, the wheels themselves take quite a beating on any long ride. Hit a stone hard enough to bend the rim and you may lose the seal on your tubeless tire or allow contaminants to infiltrate the space between the tube and your tire resulting in a worn and puntured tube. Not to mention the possibility of knocking your wheel out of balance or worse. Wheel upgrades like those made by Woody’s Wheel Works provide the needed strength, quality, and lightweight performance to take on anything the road throws at you. Poor suspension will allow too much friction energy generated from the bikes contact with the road to travel to the rider. The rider then exerts more energy to counteract, combat, and manage what the shocks should have absorbed and thus, rider fatigue sets in quickly which can ruin a ride by mid-day. 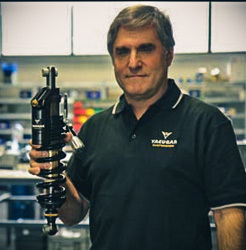 Shocks like those provided by Touratech USA and the custom built shocks from Ted Porter's BeemerShop, allow a greater level of build, length of travel, durability, and stability for your bike. These shock upgrades deliver a smoother response to the rider which deliver a far more rewarding rider experience. Click here to see our "Lights Upgrade" section. 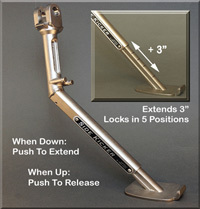 Another contributor to rider fatigue are foot pegs that are too thin, uncomfortably high, and slippery. A wide foot peg with good cleats provide the rider with more comfort and control of the motorcycle when standing for long periods of time; all of which conserve much needed rider stamina. Check out Black Dog Cycle Works' wide Footpeg options. You're sitting on your bike, a little weary from a good hard off-road ride and you extend your kickstand to get off the bike and walk around a bit. Problem is that the backcountry is very rarely level. You don’t see the downhill slope, rut, or hole where your kickstand needs to plant, and your bike tips over. You can sit there for a bit to build up the strength, suppress the embarrassment, and right your bike back up or you can avoid it all together with a telescoping kickstand. AKS Engineering makes just such a device called the Side Kicker. It’s the ergonomic upgrade you never knew you needed.